The Penderghast Puzzle Protectors Is Here! “A ‘Brilliant’ beginning to a charming new cozy series from Minnesota author Julie Seedorf. I thoroughly enjoyed unraveling the multiple mysteries alongside the Penderghast Puzzle Protectors. –Timya Owen President, Twin Cities Sisters in Crime. Good Morning. I am happy to announce that my new book The Penderghast Puzzle Protectors is now available. Writing a new series was a challenge for me as I am so invested in my characters from Fuchsia. It’s hard to top Granny and I felt the Brilliant Minnesota Series still needed a little of the quirkiness of Fuchsia but in a different way. In the Penderghast Puzzle Protectors you will meet Jezabelle Jingle and her neighbors. They too, have a little snark, a little silliness and a puzzle to solve which includes dead bodies, making a ton of trouble for the local police all the while hopefully endearing themselves to their readers. I hope you will join me in the new series. But never fear Granny will always be near. Brilliant and Jezabelle have ties to Fuchsia. And another Fuchsia Mystery is being written, so while you are waiting, check out the Brilliant Minnesota Series and follow the puzzle that may lead you to the spoils. Comment on this post as I am giving away two Kindle copies of my new book and a signed copy of the paperback. 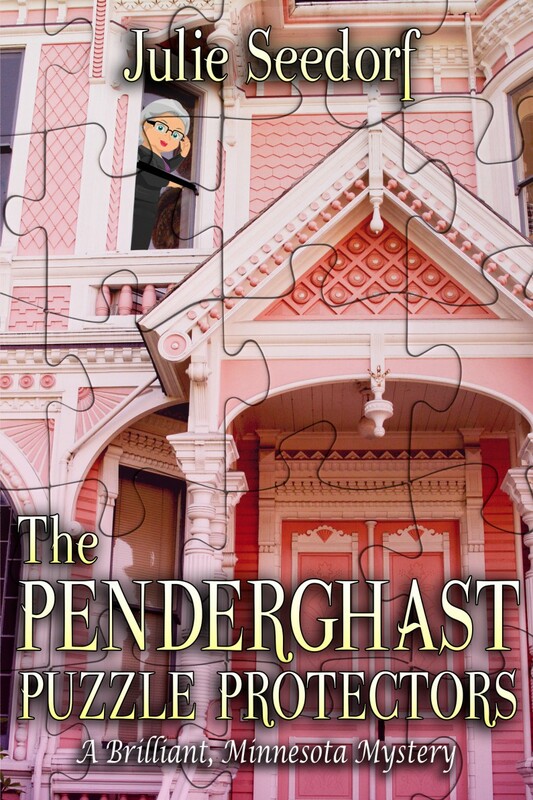 Make sure you also visit Lisa K’s blog today as she is also highlighting the Penderghast Puzzle Protectors and has a giveaway running.The Comment on our two sites and my facebook page and you might be a lucky winner. Jezabelle Jingle and her neighbors in the Penderghast section of Brilliant, Minnesota, have a mystery on their hands.Someone is stealing sections of hardwood floors in their homes and the thefts may be connected to a long-hidden treasure left by the founders of Brilliant. Not only that, there’s a dead body in a basement to add to the mix. Can Jezzy and her quirky friends figure out the puzzle and find the treasure before some other, unknown person–maybe the murderer–beats them to the punch? Or will the town’s Chief of Police, Hank Hardy, prevent the group from their sleuthing? Anything can happen in the strange little town of Brilliant, Minnesota. After all, brilliant minds create brilliant finds! Previous My Heart is With My Granddaughter! I love finding new reading adventures! This is definitely a book that would provide a great time reading. Kathleen, if you send me your email address, you won a free e-copy of my book.